We can help you to order lots of content at once. This can done through the user interface or by downloading and editing a CSV file. To begin, go to order content	and click on 'Place bulk order' at the bottom of the screen. On the next page, you will be presented with 2 options. If you require 1-10 pieces, select the number from the dropdown and click on 'Save and continue.' 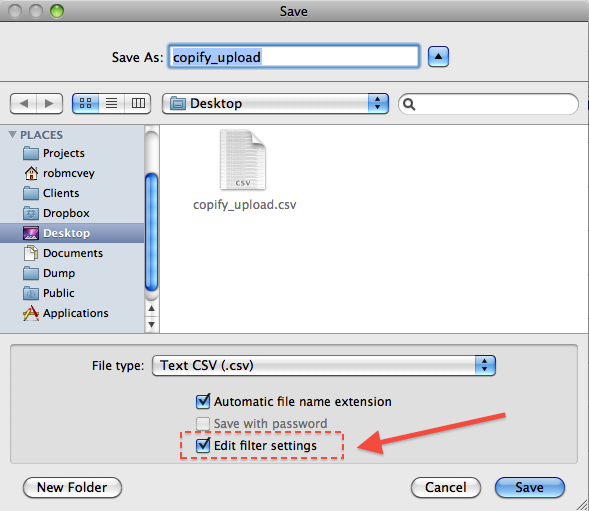 If you require more than 10 pieces, click on the link to the CSV upload tool. Tip: Orders of between 1-10 units can be easily ordered through the site's user interface. For orders greater than this, a CSV upload is generally more efficient. To place under 10 orders using the site's user interface, complete the first order form by entering a title, a description of what is required, an order type, a subject and a word count. If there are commonalities between your orders, for example if they are a series of blog posts, you can copy the first brief to the other forms by clicking 'Copy this brief to other orders' and then edit each of these orders to make them unique. If you wish to add another order, you can do so by clicking on the '+' icon at the bottom of the page. 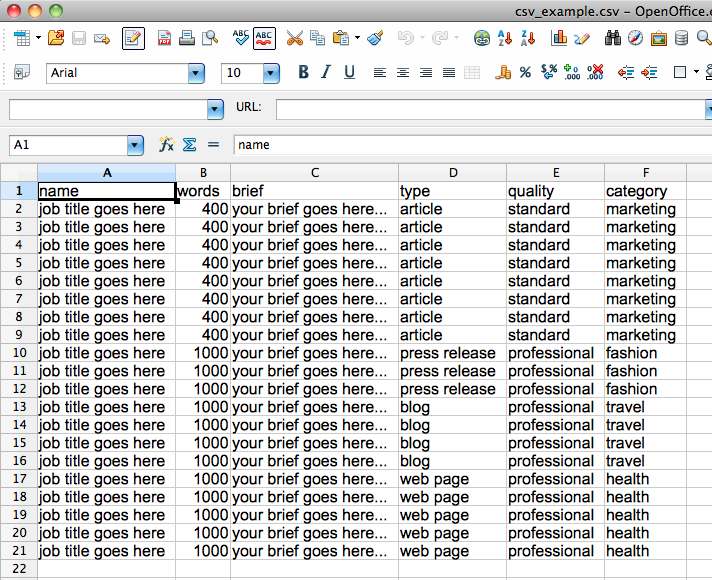 To place more than 10 orders at a time, you can download and edit our CSV tool. 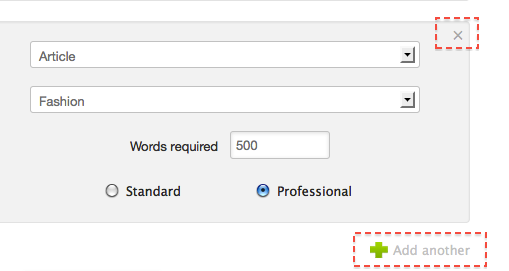 Tip: Create a common brief which refers to the title/keyword in the 'order name' column, and then simply click and drag to populate all of the fields. 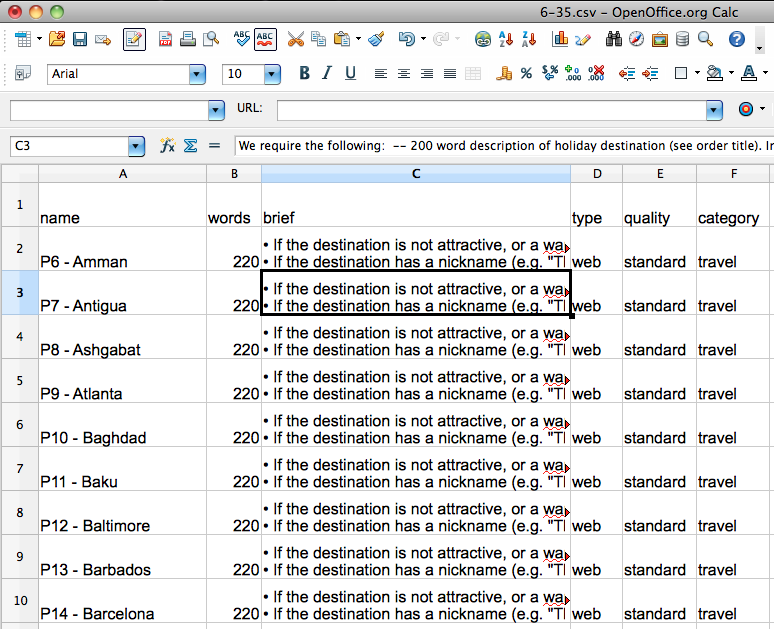 Once your order form is complete, save it as a .CSV file locally on your machine. Be sure to select the check box marked 'Edit filer settings' as you do. Once your CSV file is complete and uploaded, you will be given the opportunity to review each of the orders and if necessary, edit any of the fields. To edit, first click on the relevant column at the top of the page and then click into the specific field and edit the text within it. When you are finished, click on 'Save'. When you are happy with your orders, click on 'Confirm and go to next step' which will take you through to the checkout. Tip: Please ensure that you check that the information in each of the orders is correct before you proceed, briefs and other information cannot be changed after you have placed your order.